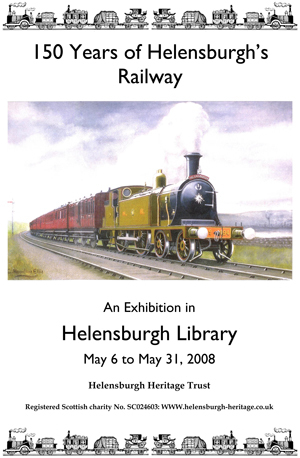 It included a section of the well known model of Craigendoran Station and Pier constructed by members of the Helensburgh Modellers Club, as well as various railway artifacts and a large collection of photographs printed and captioned by Trust member Brian Cook. The exhibition was officially opened at a private view on Saturday May 3 by Andrew Dow, former director of the Railway Museum at York, who lent the painting used on the poster. It was the work of C.Hamilton Ellis around 1890, and shows a train on its way to Helensburgh just west of Cardross. The artist gave the picture to Mr Dow's father. Trust chairman Stewart Noble, the prime mover behind the project, welcomed the guests and introduced Mr Dow, who officially declared the exhibition open. Among the guests were Provost Billy Petrie and Councillors Viv Dance and Alan Reay.